Why did John Bull change our family name? Son of Thomas Bull Jr. and Sarah Randal, John Bull was born about 1766 in Halifax County, North Carolina. In ca. 1794, at age 28, John married Hanna Harvey (age 18). Hannah Harvey was born June 5, 1776 (in either Halifax County, NC or Guilford County, NC), the daughter of Colonel Thomas Peyton Harvey (aka Hervey), Sr. and Sarahann Williams. The fact that John Bull married Hanna Harvey is significant because professional genealogical researchers have been studying Colonel Thomas Peyton Harvey, Sr. for quite some time. And as we see from the “1790 U.S. Federal Census, North Carolina, Halifax, Edgecombe”, the Bull family and Harvey family were practically neighbors. Source Citation: Year: 1790; Census Place: Edgecombe, Halifax, North Carolina; Series: M637; Roll: 7; Page: 459; Image: 268; Family History Library Film: 0568147. Harvey (Hervey) Family genealogist and author of “Mayflower to the Moon” (1984), Donald G. Hervey wrote the following about Colonel Thomas Peyton Harvey, Sr. – and mentions his daughter, Hannah Harvey (Bull). Thomas Hervey married Sarahann apparently (after May 18, 1765, when the man who may have been her father wrote his will and) before June 25, 1772, when they both witnessed the will of Barrilla Hewit. (1) As witnesses of the will, they signed themselves Thomas Harvey and Sarahann Harvey and Thomas was an executor of Mr. Hewitt's estate. Thomas and Sarahann could each write their name in an era when many people signed their name with an “X”. The Hewitt will was witnessed in Halifax County, North Carolina and the couple lived in that county at the time of the death of Thomas in February 1806. That their names appear in this document as Harvey instead of Hervey is not a problem in genealogy where if a name sounds the same, it is the same. Not only was spelling not standardized well during this time, the script which survives is often faint and imprecise. The DAR application of Thelma Bowden Freet of this line gives Col. Thomas Hervey as being born about 1740. Thomas is reported as having been reared in Paris, France. Sarahann may have been the daughter of Sarah and Francis Williams. (1) Francis died after making his will on May 18, 1765 and before July 1766 when it was probated in Halifax County, North Carolina. His will names his sons Charles Williams and Francis Williams, his daughters Betty Ann Williams, Sarah Ann Williams, Mary Ann Williams, and Jemima Ann Williams, and his wife Sarah who was living when the will was written. His will divided 400 acres, one slave, a saddle, and 40 pounds cash and left the residue to raise the children and to be divided among them when his wife died. Thomas Hervey was drafted into the revolutionary militia in 1779 as a colonel and, due to his poor health, he hired a substitute to march his Regiment to war. This is related in a letter from General Isaac Gregory to Governor Caswell. The North Carolina State Census of 1784-1787 listed Thomas Hervey, Sr. as the head of family of 11 in Halifax County including two white males between 21 and 60 years old, four white males either under 21 or over 60 years old, and five females. He owned 19 slaves with 8 of them between the ages of 12 and 50 years. The 1790 North Carolina Federal Census listed Thomas Harvey, Sr. with 12 family members and 22 slaves. On March 12, 1803 Thomas Harvey swore to the nuncupative will of his son William Harvey, who left his estate to his wife Nancy and children under the age of 21: James Harvey, Zack Harvey, Betty Harvey, Jesse Harvey, Rebecca Harvey, Amy Harvey, and William Harvey. (1) Elizabeth Sullivant, who visited the sick William Harvey on March 5, corroborated his desired disposition of his estate. William Sullivant was made guardian of the orphans. In August 1804 Thomas Hervey and Christopher Pritchett must have appeared in court in Halifax County to verify the lost will of Spencer Hurst, which they had witnessed on Dec. 16, 1780. (1) Agreeing to abide by the will so given were Spencer's wife Lena Hurst, John Pritchett, William Pritchett, James Read, and Zack Sullivant. His will merely confirmed his prior gifts of property and negroes. Finally, Thomas Hervey spelled out that two of the executors of his will, Gideon Hervey Pritchett and Peyton Hervey Pritchett are his sons but he never called Betty Pritchett his wife. On the 1810 Federal Census of Halifax County, North Carolina, both Gideon and Paton appear with the surname Hervey, not Pritchett. When first investigating this line, I concluded in my book Mayflower to the Moon - Herveys & Gables, that Betty Pritchett was the first wife of Thomas Hervey; however, birth dates subsequently found negate this conclusion. Peyton Hervey Pritchett was born August 2, 1785 in Halifax Co., North Carolina and One(y) Scyprett Hervey was born on September 7, 1776, in Halifax Co., N.C. It appears that Betty Pritchett was the mistress of Col. Thomas Hervey. The surname “Harvey” is sometimes spelled “Hervey” because it originated from the Norman name Herve', which is still common in parts of Normandy, France. People named Herve' apparently went with William the Conqueror (1026-1087) to England and Anglicized the spelling to Hervey, Haervey, or Harvey. Also note the above article by Donald G. Hervey mentions that Elizabeth Sullivant “visited the sick William Harvey on March 5” and that her husband, William Sullivant, was made guardian of William Harvey's orphans. Prior to marriage, Elizabeth was “Bettie Harvey”… Hannah Harvey's sister. John Bull's brother, Randal Bull (b. 1764 – d. 1798), married a woman named Mary Sullivant (b. 1769 – d. 1832). It's possible that Mary Sullivant was somehow related to William Sullivant. Indian lands purchased by the U.S. in 1818 opened for settlement the Western District, almost a third of the present state of Tennessee. In (or about) 1820, Hannah Harvey-Bull's brother, Oney S. Harvey moved his family west to Tennessee. Randal and Mary Bull also moved to Tennessee at approximately that time. Perhaps the two families traveled to Tennessee together (as neighbors and relatives often did at that time). While some genealogists “believe” that John Bull moved his family to Stokes County, NC before 1800, the “1800 United States Federal Census” indicates that John Bull (age 34), had moved to Salisbury, Guilford, North Carolina by 1800. Source Citation: Year: 1800; Census Place: Salisbury, Guilford, North Carolina; Roll: 31; Page: 682; Image: 639; Family History Library Film: 337907. Immediately following John Bull's entry on the “1800 United States Federal Census”, appears the name “Thomas Bull”. This may have been his brother, “Thomas Bull III”. The debate over whether John Bull moved his family to Stokes County, NC or to Salisbury, Guilford, North Carolina is moot from a practical point because: (1) the counties are relatively close (Salisbury is actually located in Rowan County), and (2) it is possible that John Bull indeed lived in Stokes County and then moved to Salisbury, Guilford. During ca. 1803, John Bull petitioned the North Carolina General Assembly (in Raleigh) to legally change his surname to “Randal” (believed to have been his mother's maiden name). The petition also listed his wife (Hanna Harvey Bull – age 27) and their four children; Oney Cypress (age 7), John Leonard “Lenny” (age 3), Jackson Harvey (age 3) and Elisabeth H. (infant). The petition for the name change was introduced into the North Carolina General Assembly on November 21, 1803, and ratified on December 22, 1803. In the years afterwards, some of the descendants of John and Hanna Randal added an additional letter “L” to their last name. For example, one of Oney Cypress Randal’s sons was known as Oney Pinkney Randall. However, at that time, if a word or name sounded the same, then the spelling was generally considered unimportant. At a General Assembly, begun and held at Raleigh, on the 21st Day of November, in the year of our Lord One Thousand Eight Hundred and Three, and in the Twenty-eighth Year of the Independence of the said State. An AD’ to alter the names of the persons herein mentioned, and the legitimate thereof. IV. …And be it further enacted by the authority aforesaid That from and after-the passing of this act, …that the names of John Bull and Hannah Bull; together with four of their children, Oney Cypress Bull, Lenny Bull, Jackson Bull, and Elizabeth Bull, to that of John Randal, Hannah Randal, Oney Cypress Randal, Lenny Randal, Jackson Randal, and Elizabeth Randal… and they should enjoy all such privileges as they should be entitled to, had they been so called from their nativity. S. CABARRUS. S. H, C.
Changing one's surname… especially in 1803, is a significant act. And must be justified by a very good reason. While we may never know the reason John Bull changed our family name to Randal (as the petition cannot be found), it is generally believed that he changed his surname because the British moniker “John Bull” was associated with describing “Loyalists” during the period leading up to the “American Revolutionary War” and beyond. With memories of the “American Revolutionary War” still fresh, and renewed threats from Great Britain (leading up to the “War of 1812”), this was certainly reason enough! Much like “Uncle Sam” is a national personification of the United States, “John Bull” was a national personification of the United Kingdom in general, and England in particular, especially in political cartoons.1) An oral history of the family, specifically involving the name change, describes how John's wife, Hanna, urged him to change the family name. This is logical because she would have likely had societal concerns being the daughter of a respected Revolutionary War Colonial — married to a man named “John Bull”! The fact that she married a man named “John Bull” may have been a political embarrassment for her and the Harvey family. The “John Bull” character was created by Scottish-born physician, Dr. John Arbuthnot, M.D. Arbuthnot was a successful physician, writing on the value of diet in the fight against disease and was eventually appointed “Physician-in-Ordinary” to Queen Anne (1704). However, it is as a political satirist that he is best remembered. In 1712, Arbuthnot created “John Bull” in his pamphlet “Law is a Bottomless Pit” (1712). Originally derided, William Hogarth and other British writers made Bull “a heroic archetype of the freeborn Englishman.” Arbuthnot continued developing the character “John Bull” as the typical Englishman in a collection entitled “The History of John Bull” (1727). While the character of “John Bull” changed over the years (much more so than his U.S. counterpart, “Uncle Sam”), he was usually depicted as a stout, middle-aged, country dwelling, jolly, matter-of-fact man. The political cartoons shown here dated 1798 would have been the image our ancestor associated with him prior to changing his name. Initially, Bull was almost always depicted in a buff-colored waistcoat and a simple frock coat (in the past Navy blue, but more recently with the “Union Jack” colors). As the character evolved, Bull was usually portrayed as a stout, portly man in a tailcoat with light-colored breeches and a top hat which by its shallow crown indicates its middle class identity. During the Georgian period his waistcoat is red and/or his tailcoat is royal blue which, together with his buff or white breeches, can thus refer to a greater or lesser extent to the 'blue and buff' scheme, used by supporters of Whig politics (a UK political party who contested power with the rival Tories from the 1680s until the 1850s) – which is part of what John Arbuthnot wished to deride when he invented the character. By the twentieth century however his waistcoat nearly always depicted a “Union Jack” Flag, and his coat was generally dark blue (but otherwise still echoing the fashions of the Regency period). He also wore a “low topper” (sometimes called a John Bull topper) on his head and was often accompanied by a bulldog. 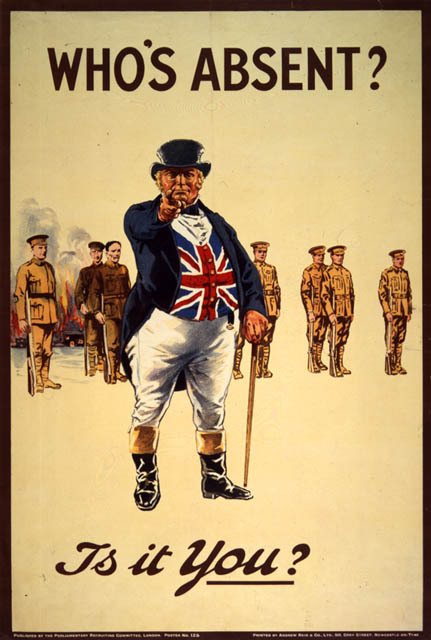 John Bull has been used in a variety of different ad campaigns over the years, and was a common sight in British editorial cartoons of the 19th and early 20th centuries. As a literary figure, John Bull is well-intentioned, frustrated, full of common sense, and entirely of native country stock. Unlike “Uncle Sam”, he is not a figure of authority but rather a yeoman who prefers his small beer and domestic peace, possessed of neither patriarchal power nor heroic defiance. Arbuthnot provided him with a sister named “Peg Bull” (personifying Scotland), and a traditional adversary in Louis Baboon (the House of Bourbon in France). Peg continued in pictorial art beyond the 18th century, but the other figures associated with the original tableau dropped away. The character John Bull's surname is also reminiscent of the alleged fondness of the English for beef, reflected in the French nickname for English people, les rosbifs (the “Roast Beefs”). And it is also reminiscent of the animal, and for that reason Bull is portrayed as “virile, strong, and stubborn” like a bull. This print was published on 24 October 1798, just after Nelson's victory at the Battle of the Nile. He is shown in the forefront of British admirals and naval heroes, serving up victories for ‘Old Grumble-Gizzard’, the British public, to satisfy its appetite for ‘frigasees’ of enemy ships, washed down with 'True British Stout'. In 1807, John Randal appears in the Franklin County, Georgia Tax List (Page 088, Database: GA 1792-1819 Tax Lists Index). At that time, Franklin County was not at all as it is today. Franklin County, was created in 1784 from lands obtained from the Cherokee Indian Nation, and named for Benjamin Franklin. It covered a large part of upper Georgia, from the present day borders of Rabun and Towns counties to Clark and from the Savannah river to the Oconee in Hall and Jackson counties. The county seat of Carnesville was laid out in 1805 and named for Thomas Peter Carnes. Franklin County encompassed a great area that was eventually broken into the counties that you see here. Today Franklin County is much smaller than it was when it was formed from territory ceded to the United States by the Cherokee (Treaty of Long Swamp, 1782) and Creek (Treaty of Augusta, 1783) Indians. At that time it included all of Barrow and Jackson counties, significant portions of Oconee, Clarke, Madison, Banks, Hart, Stephens counties, parts of Gwinnett, Hall, and Habersham counties, and the northwestern corner of South Carolina (present-day Pickens, Oconee and Anderson counties). This land was among the last land in Georgia to be distributed under the corrupt “head right” system. In 1789 the head right system passed from state to county government, making them even more corrupt, while the state began to grant huge tracts of land to speculators. These policies ended with the Pine Barrens Scandal and Yazoo Land Fraud (1795-1796) and the head right system was replaced with a “land lottery” in 1803. In 1819, a “J. Randal” appears in the Franklin County, Georgia Tax List (Page 093, Database: GA 1792-1819 Tax Lists Index). And in the “1830 United States Federal Census”, John Randel (probably a mis-spelling by the census taker) appears in Franklin County, Georgia. Source Citation: 1830 US Census; Census Place: Franklin, Georgia; Page: 213; NARA Series: M19; Roll Number: 17; Family History Film: 0007037. The “free white male” between 10-14 years old (identified in the census) was possibly a grandson. Oney Cypress Randal (obviously named for Hannah's brother, Onesiphorus “Oney” Scyprett) was born February 5, 1796 in North Carolina. He remained in Franklin County, Georgia when his parents died, and many of his descendants remain there today, spelling their name Randall. Jackson Harvey (“Harry”) Randal was born on November 27, 1800 in North Carolina. He married Mary Ann Trimble. They moved first to Louisiana and then to Texas. Jackson died in Meridian, Texas on December 9, 1881. Mary Ann died in Meridian, Texas on February 15, 1865. Pinkney Harvey Randall, born about September 5, 1814, married Catron G. Pace on June 6, 1837. Pinkney and Catron had 6 children and stayed in Georgia. Pinkney died on January 27, 1887 in Fulton, Georgia. Catron died on November 6, 1864 in Milltown, Georgia. Hannah Harvey Randal died on Nov. 25, 1832 (age 56) in Franklin County, Georgia.